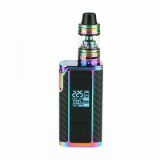 Vapeonly Captain PD1865 Kit comes with a Captain PD1865 TC MOD and a Captain Mini Tank. Just get it for an amazing vaping experience. Vapeonly Captain PD1865 Kit comes with a Captain PD1865 TC MOD and a Captain Mini subohm tank. The IJOY Captain PD1865 MOD is powered by dual external 18650 battery batteries. As a high quality device featuring a maximum 225W output power, the Captain PD1865 features compact size with no overhanging 30mm tanks and NI/TI/SS/TCR temperature control. Inherited from the Captain family, the newest Vapeonly Captain Mini is a 3.6ml Subohm Tank with 22.5mm diameter. It comes with a convenient sliding top filling design, unique Groove chassis to reduce heat transmission, dual adjustable bottom airflow and a Delrin wide bore drip tip. It also adopts an innovative CA-M2 no threaded coil head for easy replacement. Perfectly Compatible with the CAPO 100 MOD. • No e-juice or 18650 batteries included. Este cigarro electrónico me ha facinado, ya que tiene un aspecto muy bueno y las teminaciones son excelentes. Me agrada las terminaciones que tienen, debido a que tiene una parte muy parecida a la fibra de carbón. La pantalla tiene todo lo que necesita un cigarro electrónico y es muy simple utilizarlo. El atomizador cuenta con una capacidad muy buena de líquido, además tiene un agujero para colocar el líquido muy bueno , es cuestión de deslizar para ver el agujero e introducir líquido. La capacidad de tener dos baterías hace que tenga la potencia para poder llegar hasta los 225w. lo recomiendo,ya que es un cigarro electrónico con tadas la caraterísticas necesarias. 1. It's very nice to do it and not to make up some kind of iridescent material. 2. Its button has a strong good pressure point and is stable in its erection, so it will not be a problem. 3. The screen is something wonderful. We can get a lot of information about it and there are no problems with its brightness. 4. 510 steel joints and good springs. 5 Strong battey door. 6. Switch to the electronics. Compared to its price, it's comparable to the more expensive MODs, because it handles the battery well and smoothes it evenly. I have not tried TC mode so I can not open it. Great Unit, for a great price!!! One of my best kits ever. For this price it's unbelievable. The mod is very handy for a dual 18650 mod and well finished. The atomizer produces big clouds with excellent flavour. Very decent device. The kind of very high quality, gives the impression of original and expensive things. Was present, hostess happy. Опыти with вейпами No, therefore evaluate its escarpment is difficult. From the quick hit to the consistant flow and incredible flavor, this is a mod that will continue to shine for years to come. Juice capacity will keep one going all day and easy to use controls, this Polar mod is absolutely stellar. Product has been ordered 13.11.2018 came to-Almaty 30.11.2018. Major damage to the box was not the only little bruising. After opening the box and removing Drip-type in Icare I noticed the product was manufacturing defects. Rubber valve sensor whose words don't touch was take cover. Very disappointing. But this workmanship, seller not to blame.